I want to follow a story, on it’s journey from an individual through to a global business. It starts with a time when we learn something. This creates the initial disturbance, it causes us to think about change. As we go through that learning, we are building a personal narrative: this is done as we talk things through, as we play with the knowledge and skills and, most importantly, as we find the time to reflect. Personal narratives may be actively created as part of the learning process, through the use of social tools or blogs. For me, the blog here forms my personal learning narrative. The second level of narrative is co-created in groups: it’s about collective sense making activities, about sharing, challenge and support. It may be structured, in scaffolded social learning experiences, or entirely social. The process of co-creation causes us to explore our thinking further, to edit and refine it, to maintain a pace of change. It lets us create shared value and momentum. 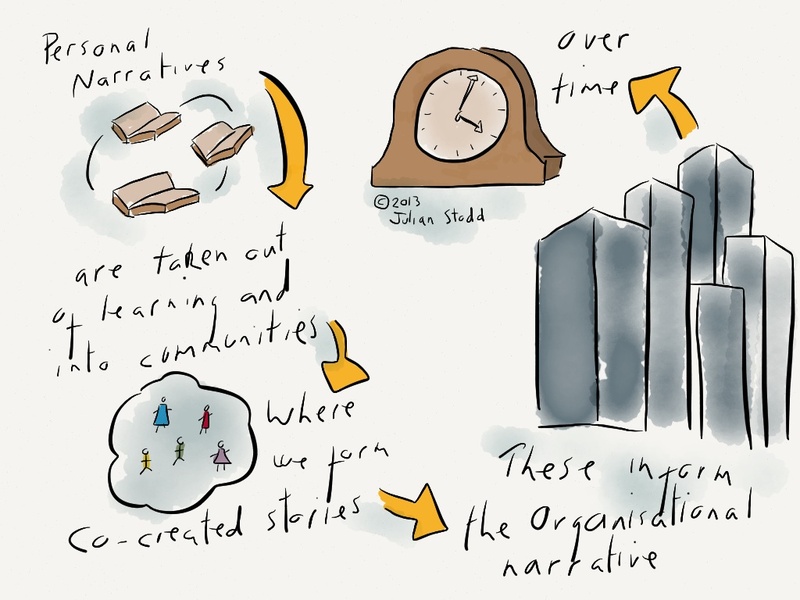 Co-created narratives are told out of these communities and, in turn, inform organisational ones. Co-created narratives take longer to write. Over wider spans of time, organisations form their meta narrative: it’s informed by the groups and, in turn, individual stories. The story arc is wider, it’s collectively informed and told through a wide lens, but it’s not independent. Any organisational story is rooted back to the individuals. These are stories of change, and change is founded on realities that are created in the moment, within our communities. Providing space for narrative, space to learn, ultimately that’s what drives change. This entry was posted in Agile, Blog, Blogging, Change and tagged Agility, business, Change, Co-creation, Creativity, Narrative, Organisational Learning, personal narrative, Stories, storytelling. Bookmark the permalink. Thanks 🙂 i visited your blog – your piece 24th october on race and ethnicity is excellently written and thought provoking. Thanks Julian. I’m inspired each day to add to the global discussion-adding to the knowledge community.